Kyle Larson has been the bridesmaid at Bristol Motor Speedway several times, but he broke through with a victory Friday night, dominating the Food City 300 NASCAR Xfinity Series race. 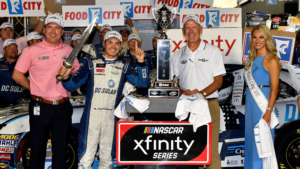 Larson has finished second at Bristol four times, including three in the Xfinity Series. He led five times for 202 laps Friday, holding off Christopher Bell and Justin Allgaier in overtime for the win. "I've said it a lot, but I've always been fast here," Larson said. "Just have come up short there at the end of the races. I've learned a lot about this place and how to be good on long runs. … It feels really, really cool to win a race here - finally at Bristol. I've been close so many times. This is my best race track by far, I feel like. It feels cool to win." Bell was second, with Allgaier third, Cole Custer fourth and Joey Logano fifth. Sixth through 10th were Elliott Sadler, Michael Annett, Chase Elliott, Tyler Reddick and Matt Tifft. Larson fought back after pitting following Stage 2, restarting 11th on lap 177 but moving to the lead 27 laps later. He was hardly able to cruise from there, though. After passing Bell for the lead, Larson was unable to pull away. With 46 laps to go, the two were side by side, with Larson working the high side in the corners like he had all race. But Bell couldn't clear him as the two long-time dirt track foes battled it out. The leaders pitted under yellow with 29 laps remaining, with Bell losing a spot on pit road and restarting in the undesirable bottom lane. Bell slipped back couldn't muster a challenge to Larson, even as he came back to second place. "I thought we had a shot at him if it stayed green," Bell said. "Even with the yellow, I thought we were going to have a shot at him. But that second-to-last run, me and Kyle were really equal. I told my crew chief Jason (Ratcliff) that I couldn't be any looser, and he tightened up for the last run. Tightening up and then restarting on the bottom, (we) lost track position. Just couldn't ever get back up there to challenge (Larson). I wasn't good enough to pass those guys." Allgaier had been good on restarts the entire race and challenged Larson for a lap on the overtime restart on lap 308. But Larson was able to survive. "I don't think (Bell) made the wrong decision there," Larson said. "I just think he it was kind of circumstances of (lapped cars) being two-wide and my lane got moving a little bit better." Polesitter Kyle Busch dominated Stage 1, lapping all but 11 drivers before a left-front tire went flat and he smacked the wall. Busch led the first 69 laps and was ahead of second-place Larson by more than four seconds at the time of his troubles. He pitted under caution but the right-front A-arm was broken, and Busch had to retire. "It was just rubber on top pf rubber," Busch said. "Went into the corner a little too hot, and two or three laps later, the tire blew out." Custer stayed on the track under yellow and took the lead, but Larson stormed past on lap 80 and hung on for the Stage 1 victory. Larson then dominated Stage 2, leading all but one of its 85 laps, beating Ty Dillon and Elliott to the stage victory.